(it’s on my list of the only five money books anyone needs to read). In case this is new news to you, the reason I’m a fan was that I read it as a younger man, did what it advised, and became wealthy as a result. Pretty simple. which I recently reviewed and loved. Over time I communicated a bit with Sarah over Twitter and she was kind enough to send me an advance copy of her book to review. and she gave me permission to post the section below. So that’s how we come to having an excerpt today. As someone who interviews millionaires, I’m always interested in what they do investing-wise. My findings are that millionaires are generally pretty simple investors but I’m obviously not conducting a professional study of them. That’s why I like the excerpt below because Sarah has done her research. People seem fascinated with millionaires in general but with their investing habits in particular. I think it’s because people either expect some get-rich-quick investing secret or some exotic list that includes buying Caribbean islands or putting money in alt-investments that make Bitcoin look old. Of course they don’t get that, but that’s what I think many want/expect. Investing is a simple subject that’s been complicated way out of proportion. So anytime we can get down to a few facts that clarify the basics, I’m all for that. I like bringing new thoughts to ESI Money readers and this is a different topic than what we’ve covered previously. That’s why I’m excited today to run this post. I think it will be new, interesting, and we’ll all learn something from it. As for now, let me turn it over to the book itself to do the talking (BTW I’ve changed the formatting a bit to make it easier to read on the web, but the content is word for word from the book). The investors who inhabit the real world and those who populate academic models are distant cousins. In theory, investors hold well diversified portfolios and trade infrequently so as to minimize taxes and other investment costs. In practice, investors behave differently. They trade frequently and have perverse stock selection ability, incurring unnecessary investment costs and return losses. They tend to sell their winners and hold their losers, generating unnecessary tax liabilities. Many hold poorly diversified portfolios, resulting in unnecessarily high levels of diversifiable risk, and many are unduly influenced by media and past experience. Individual investors who ignore the prescriptive advice to buy and hold low-fee, well-diversified portfolios, generally do so to their detriment. Action bias, or the propensity to take action as opposed to taking no action, can lead investors of any level of experience to take action when no action is required. These extreme investing “doers” end up buying and selling at the wrong time because they have a propensity toward taking action. The other side, of course, includes those who are averse to taking any action, taking their time instead to create investment strategies that may be obsolete before they are even ever implemented. What makes a successful investor? One who is able to invest when the market is down and be comfortable with investments that have higher associated risks with them? 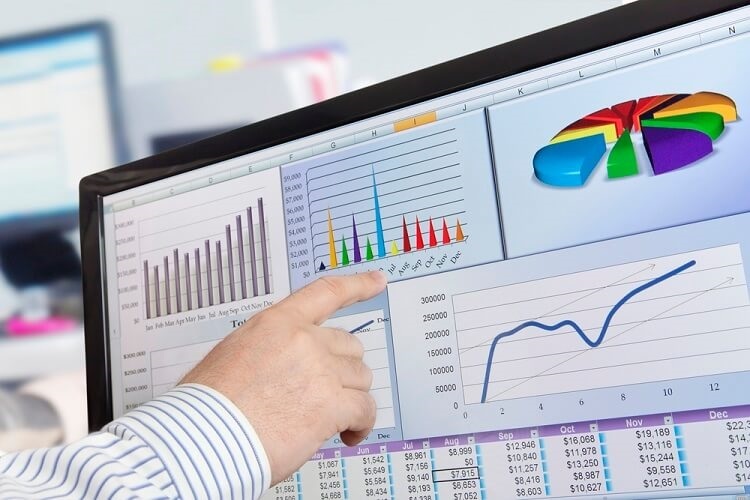 Like the behaviors that distinguish high-potential household CFOs from those who are less able to build wealth, there are a few characteristics and behaviors that separate successful investors from others regardless of the economic times or governmental factors. We know that courage and a willingness to take risks are highly related to net worth. Millionaires throughout the past decades have shared that courage allowed them to weather storms not only in their own careers or businesses, but also in their investments. The courage to invest takes some level of confidence to make an investment-related decision as well as the personality to want to engage in investing in the first place. And, we also know that financial knowledge and risk-tolerance are related. Knowledge, in particular, can be gained through self-study and research, and as has been the case over time, prodigious accumulators of wealth tend to spend more time researching and planning their investments than their under accumulating counterparts. The data also tell us that those who are anxious and worried tend to engage in more short-term, potentially detrimental investing behaviors. In our research in creating an experience- and behavioral-based psychological test of risk tolerance, we found five distinguishing components of “good investing”—good being defined as being generally comfortable with investing in the stock market and buying (versus selling) in a down market. Successful investors tend to be able to make investment decisions even when the exact outcome is not yet known. They tend to be comfortable making investments even without perfect certainty of what the future holds. While overconfidence can trick investors into making ill-advised decisions, some level of self-confidence and self-efficacy differentiates successful from unsuccessful investors. Without an effective dose of confidence, investing-related decisions may be second-guessed and ultimately changed, often with disadvantageous financial effects. Those who build knowledge in how investing works, the potential up and downsides of investments, and the cyclical nature of the stock market are more likely to make better investment decisions overall. We know that prodigious accumulators of wealth spend time researching investments more so than their underaccumulating counterparts, and that investing knowledge relates to better investing decisions. Composure typically refers to the ability to withstand changes (typically, downturns but also boom times) in the market. Those investors who can remain calm and courageous in the face of a market crash tend to make better decisions than their anxious counterparts. The successful investor profile above pertains to a broad sample of investors, including those in the mass affluent. And as in the case of building wealth in general, it is a combination of these characteristics and behaviors that can impact our ability to obtain success in investing. What, then, are the characteristics of millionaire investors? Are they similar to what we’ve found with broader samples of Americans? Millionaire investors tend to be a confident group. In our latest study, just over 70% of them believe that they know more about investing than others. We know that confidence in investing can be a double-edged sword, as overconfidence in investing can have detrimental effects on investment-related decision-making (e.g., a belief that you can time the market). 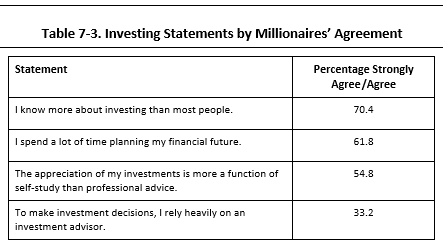 When it comes to how they invest, nearly 55% of millionaires believe that investing success is due more to their own efforts in studying and becoming educated than advice they receive from professionals. Similarly, just under one-third of millionaires reports relying on a financial professional to make investment-related decisions. We see, too, in research conducted with mass affluent investors, that those who have the best investing-related behaviors also tend to be more likely to fire an advisor or other professional they deem to be less than valuable. The take-away for financial professionals targeting millionaire investors is that they should be the best of the best and clearly convey that reality to their target audience. Millionaire investors spend time building knowledge and expertise in managing investments. They spend on average 10.5 hours per month studying and planning for future investments, and we see differences in prodigious accumulators of wealth versus under accumulators of wealth in those hours: specifically, 11.3 hours per month for prodigious accumulators compared to 8.7 hours per month for under accumulators. They spend time researching investments and where to place their money, even if that means investing their money in their own businesses. We know that their literacy in financial matters means that they are more tolerant of taking investment-related risks. Future outlook and financial knowledge typically relate to taking greater financial risk, so the time they spend in managing and researching investments helps in decision-making. Investors who have a bias toward taking action, any action, in the face of new, seemingly relevant information, tend to perform worse over the long haul. Millionaire investors do take some action in managing their investments. On average, in 2016, millionaires made 17 investment-related transactions throughout the year. 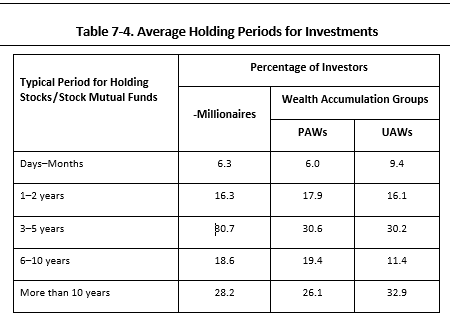 About one in five millionaires holds his investments for less than three years. The importance here is in whether the decision to take action was prudent and well-thought-out, or if it was rash (and the result of action bias). Appropriate financial decision-making is a complex mix of knowledge (including financial literacy), future orientation, and remaining calm in the maelstrom of environmental factors. We tend to make better decisions about our finances when we have both a long-term and future-oriented outlook, when we have the knowledge required to make appropriate financial decisions, and when we’re calm. These factors have been found both in the laboratory and in the field. Traits make as much difference as anything. Discipline and composure really stood out to me here. These are very similar to traits found on my list of qualities needed to reach financial independence. Knowledge is power. Millionaire investors are students. My guess is that they read a lot about personal finance in general. It’s likely an interest for them (it is for many of the millionaires I interview as well as for myself) which gives it a double benefit — it’s something enjoyable that also has a pretty big life benefit.
. As I’ve noted, I’m not sure that book is quite truthful about the use of planners as Dave Ramsey actually refers people to them. Anyway, lots of good stuff here. What did you learn or find interesting in this excerpt? I’ve never used a “planner” for investing. The one time we had our tax return prepared by an accountant we found errors on the return. I’m also skeptical that index fund investing will remain safe given the massive concentration of funds within a few firms. We prefer picking stocks and holding them for years. We like to research companies. Looking for the big demographic trends and investing in companies servicing those trends is fun. Action bias is indeed something that can hurt a lot of investors. It can be hard to just let things ride and do nothing (one of my friends proclaims index fund investing is boring and he requires more excitement and thus invests in individual stocks and does so in his retirement accounts). I agree as well that most high net worth individuals do not engage in financial planners as much as was indicated by the Everyday Millionaires findings which as you said may be biased by the Ramsey effect. Of those I would say composure is the most important. You just can’t freak out when things go down, even if it lasts years. Easier said than done. For most people seeking or achieving Millionaire status, earning and savings seem more important than savvy investing, at least early on. Simple investing to predictably grow assets seems to work just fine for most people. It’s only when you start having significant assets that squeezing out better investment returns improves your outcome in a meaningful way. Great post, as always. Thanks for sharing! Thanks for sharing, I think one of the main drivers to becoming a millionaire is staying the course. Most people get bored and let the media drive their attention. As a result, they lose focus, get nervous when times are tough and end up losing money when they change course. If you’re a dollar cost average’r contribute all the time, when the markets up and when its down. Don’t focus on the day to day market distractions. Funny wrt Financial Planners… I have used them in the past and currently. Ironically I started paying attention to things much more during the 2008 crash and after when I lost confidence in my FP. He controlled all my investments and did poorly post crash IMO. I decided I needed to be more educated and engaged- it’s my money after all! My current FP is good but we often disagree on some things. I control all my investments and no longer invest in equities or funds that I don’t fully understand or want. She helps push me along with things like estate planning, etc that I’m really bad about. In a lot of ways I use her for a sounding board. Not sure I’ll continue with her but she’s not costing me a lot of money and I like having a resource to bounce ideas off.